Although the early spring garden starts at ground level (when low woodlanders grab the opportunity to flower whilst the leaves on the trees above are still trussed up in tight buds), the spring spectacular soon moves up to eye level. It’s then that masses of pale-pink and virgin-white blossom tremble against an egg-shell blue sky, announcing that spring has sprung. Cherry blossom, magnolias and species lilac can light up every garden, and new breeding is tending to produce compact plants that flower early in their life. Therefore, you no longer have to wait twenty years for a magnolia to decide to flower. Mark Drury, a New Zealand raiser, has named three spring crackers to light up your garden whatever its size. The fragrant Daphne ‘Perfume Princess’ flowers in the first half of spring due its Daphne bholua parentage, but it’s also easy to grow because the other parent is D. odora, a later performer. ‘Perfume Princess’ a slender, columnar plant, rising to shoulder height. If you want something lower growing opt for Daphne odora 'Aureomarginata', the easiest Daphne of all to grow. You you do need space for this, because this low growing plant can cover four to five feet of ground. There’s plenty of flower and the cream-edged green foliage is handsome. Mark Drury also works with magnolias and he’s named two new ones. ‘Fairy Blush’ has blush-pink flowers along the stems and each cup-shaped bloom is framed by evergreen foliage. However like many an early-flowering shrub, it will drop its foliage in cold winters. As the flowers mature they adopt a languid look and a darker raspberry-pink eye so they never look anaemic. The aptly named ‘Black Tulip’ produces reddish purple flowers in March, before the foliage appears. The rounded petals form a tulip-shape, hence the name. Always avoid low-lying ground where frost lingers and don’t dig close to the plant. These shallow-rooted plants resent disturbance. If you’ve got fertile neutral to acid soil, both of these magnolias will grow for you. The later-flowering magnolia, ‘Susan’, is particularly good in a small garden as a centrepiece and it usually avoids frost damage. It will reach 4m when mature and there’ll be plenty of upward-facing tulip flowers. These emerge just as the leaves appear so the flowers are often supported by new foliage. This widely admired, upright magnolia has the Award of Garden Merit from the RHS. Ornamental cherry trees come in all shapes and sizes, but Prunus ‘Little Pink Perfection’ will only get up to shoulder height. Deep-pink buds open to produce frilly pink flowers set against bright-green foliage. ‘Accolade’ will reach 4m once mature and the mid-pink flowers smother the branches in April. If you want something shrubbier, opt for the dainty P. incisa ‘Kojo-no-Mai’. 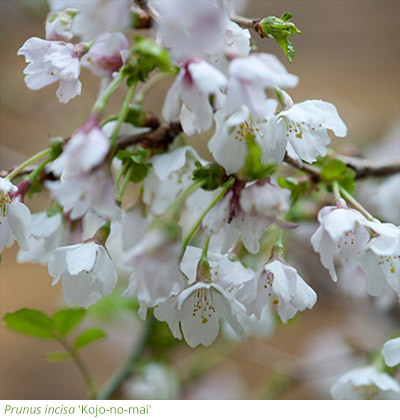 The stems on this small Fuji cherry seem to twist and turn and at every juncture there are pale-pink flowers suspended on long stems, each one with a darker pink eye. It’s confetti, stuck to branches, and there’s nothing like it in the spring garden. Surround it with blue Muscari or grape hyacinths, in wilder settings, and then just enjoy it! It never fails to shine year on year. If you want some fragrance, there are lilacs with tubular flowers in subtle shades that hover between pink and lilac and they deliver a heady, lily-like perfrume. These small, shrubby plants shouldn’t be confused with tall tree lilacs such as ‘Sensation’ and ‘Charles Joly’. Although these cut really well, they aren’t very fragrant. The Flowerfesta Series of Syringa meyeri, which comes in pastel shades of pink, purple and white, is a repeat-flowering type of Korean lilac that flowers prolifically in April and then has flushes until October. It’s really fragrant and good to pick. The Bloomerang Series also repeat flowers, and there’s a vibrant, dark-purple form. If you want something slightly more airy opt for ‘Red Pixie’, for its combination of lilac-pink flowers with reddish purple tubes. You could accommodate all three in large containers, should you wish, or plant them in a warm position. Snip the faded flowers off afterwards because they do brown by midsummer. 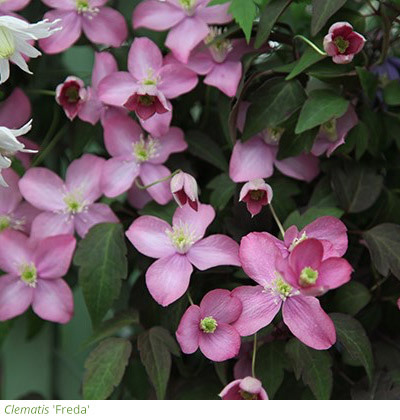 If you’ve a warm wall that faces south or west, Clematis montana, has an abundance of flowers in May. This no-prune clematis, which can be tidied lightly after flowering if needed, could cascade over a porch, cover a shed, or climb an arch. ‘Freda’ is perfect for a smaller garden, because she has plenty of strong-pink, starry flowers and climbs up to ten feet in height. The deep-bronze foliage of ‘Freda’ is also very striking, but she only has a slight fragrance. ‘Broughton Star’ is a shaggy, semi-double with two rings of plummy-pink outers surrounding red-purple slender inners. The flowers are framed by dark, substantial foliage, but there’s no fragrance, although it can reach 18 feet in height. 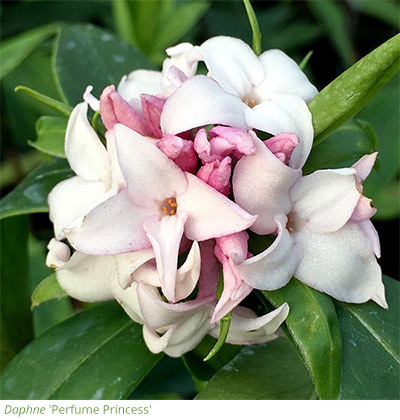 ‘Pink Perfection’ has simpler cool-pink flowers, but it’s one of the most scented. They will all light up early May, although they’ll take a year or two to get going. With so much pallid blossom it’s important to have strong flecks of colour on the ground and the compact Bergenia ‘Overture’ will provide rhubarb-red leaves and plenty of vivid-pink flowers. 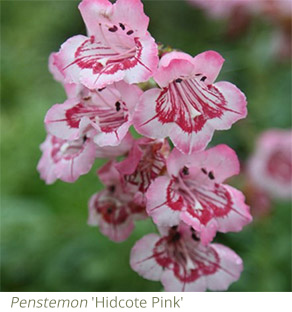 Bergenias vary in habit and some need huge amounts of space, but ‘Overture’ doesn’t. Add the white hardy geranium, G. macrorrhizum ‘White Ness’, because this compact spring-flowering geranium has white flowers that emerge from apple-green buds. It’s far less rangy than most forms of G. macrorrhizum and the pale-green foliage is not quite as pungent. Most summer-flowering roses and perennials are still sleeping beauties yet to wake. Make sure you add some early colour and the bleeding heart, now named Lamprocapnos spectabilis, has coppery new foliage that picks up new rose foliage brilliantly well. The stems arch over very elegantly and the pink and white form is excellent. Mark its position with a suitable tulip, because it has soft fleshy stems that are easily damaged. The bright-pink Triumph tulip, ‘Barcelona’, sets of the pink and white lockets of this bleeding heart. Use the pure-white form in shade, with Tulipa ‘Spring Green’. If you love showstoppers, invest in the hybrid peony ‘Bartzella’. This American-bred hybrid between a tree peony and a perennial peony has huge lemon flowers on knee-high woody stems. Each stem should produce side buds, so this flowers for longer than most tree peonies. 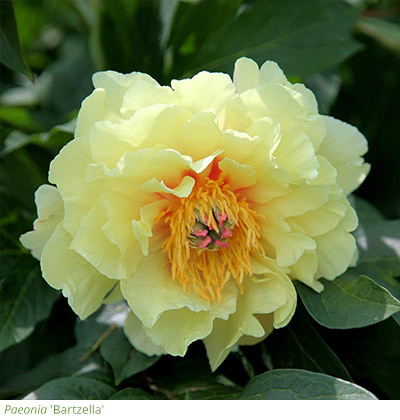 You can’t possibly miss the light-yellow flowers and the dull-green foliage, inherited from the tree peony side, is a great foil. Plant it as a stand-alone specimen, in a key place on the edge of a border. It’s strong and spectacular and when ‘Bartzella’ first appeared in 1986, one root cost $500. This showstopper is now extremely affordable and just as good - if you like brash! 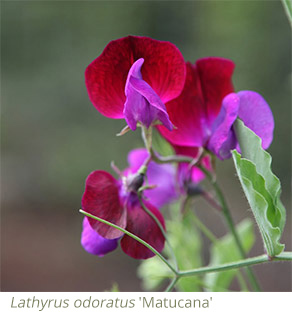 If you missed the boat on sowing sweet pea seeds, go for sweet pea plants instead because these will soon get away. 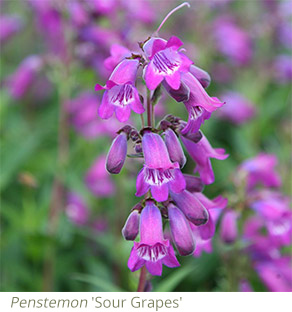 Buy and plant late-season plants now, including penstemons. The free-flowering 'Andenken an Friedrich Hahn' produces refined wands of garnet-red flowers for months. ‘Sour Grapes’ is a heat haze of soft blue with pink overtones and ‘Pensham Laura’ is a candy-pink edged with white. Cut back weather beaten penstemons, hardy English lavenders and pinks now. Hopefully they will already be shooting from the base, but if they look weak it may be better to replace them. Make a container of herbs, or a small herb garden, with a mixture of herbs. 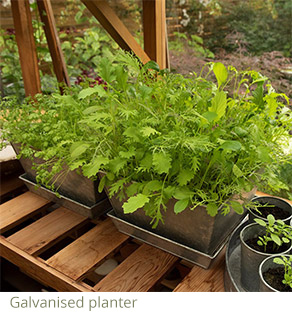 Be imaginative, you could use a galvanised container, or even a large hanging basket. On damp days you can gather herbs without getting muddy. 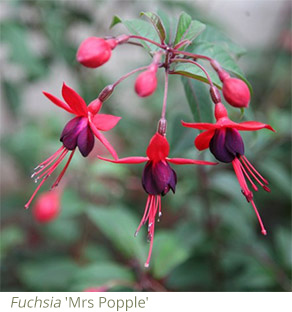 Late-April is a good time to plant slightly tender late-summer plants such as the hardy fuchsia ‘Mrs Popple’, so that they have time to put down roots. Perovskias and tender salvias can all be planted now in warm, sunny positions. If a late frost is forecast place a bucket overhead, or fleece your new plant.